Entatio generates and captures presentation engagement data for advanced AI. Better forecasting, better sales process, happier customers. Organize your sales presentations on a platform that connects directly to Salesforce.com to generate meaningful engagement data. Create a CRM integrated customer success program that streamlines communications and connects customer success activities to sales processes. Generate data for commercial analytics that shows how prospects engage with your organization’s messages, finally connecting sales and marketing in meaningful ways. Do you give presentations? Do you use PowerPoint, interactive digital aids, PDFs, images, video and other media in those presentations? Does your organization use enterprise technology such as Salesforce.com and Amazon Web Services (AWS)? Do you ever take your presentations mobile, to conferences, events, on sales calls and training engagements? If you answer yes to these questions, Entatio was made for you organization. Learn more through our many use cases. This article goes step by step through the process for building a powerful customer success program using Entatio.com & your CRM. Drastically expand the ROI for your conference & event exhibits with a low cost, rapidly deployed, content marketing tool for exhibits. You have PowerPoint presentations. You want to deliver, share and track these across an audience. Done – use Entatio.com. It’s free for 1 presenter, up to 1 GB of data. Just click that button below to get started. It takes just a few minutes to setup. No credit card needed. No high pressure sales. What are you waiting for? Do you not have a PowerPoint? Do you have one, but you don’t really want to share it? Is it your secret PowerPoint presentation? Do you make presentations to give to yourself? Do you line up stuffed teddy bears on a couch at home and give them made up presentations? Believe it or not, Entatio works for that too. The Pharmaceutical Industry uses Veeva based Closed Loop Marketing (CLM) and iVA presentations to deliver valuable information to Health Care Providers (HCPs). Entatio is designed to support those same presentations and files, making it possible to present, share and track engagement to your Brand’s Veeva CLM presentation across a much wider platform with the same tracking for compliance. Additionally, the Entatio for Salesforce.com app integrates directly to Veeva and Salesforce.com. Send presentation data from events, conferences and other engagements directly to your CRM. Project leadership that sends clear messages to the right people run more efficient projects. 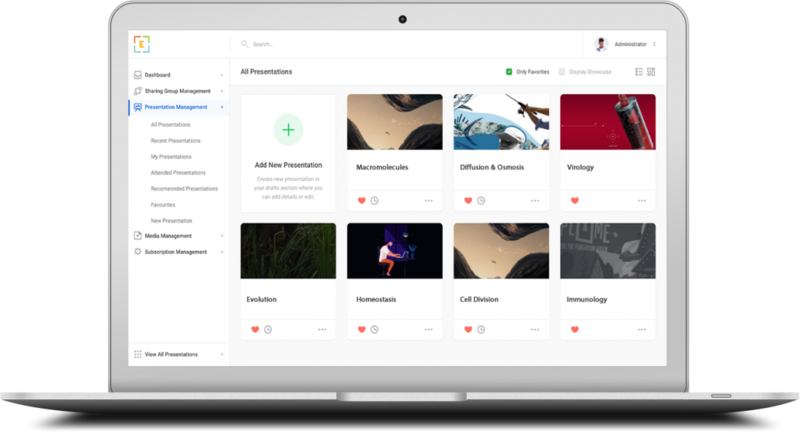 Entatio is able to consolidate your project presentations, automate sharing so that only the right people have access to the right information and provide analytics that develop a real time visual of how knowledge is moving and changing across your project team. The end result are clear messages reaching the right people. Have more than 25 presenters? Contact us for special pricing.